My art history professor would just LOVE this. Awesome, awesome, awesome. Love it - fantastic :)! I love it! The colors are great and the bunny is awesome. Great job! I LOVE this! Weird and funny! 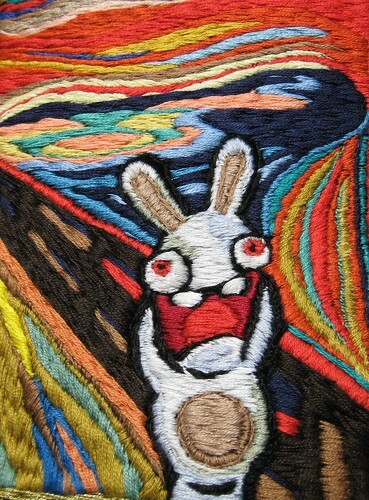 It's a Raving Rabbid! HA! I saw this on flickr the other day. it is super cool. Oh, that totally cracks me up! Thanks for that! What a great twist, and wow, all that fill stitching! Miss Fae- The circle is his tummy! haha I love it! Raving Rabbids are so cute and hilarious! <3 :] Awesome job!